This is the follow-up blog entry to “So, you want to get another degree?” I have received quite a number of inquiries with regards to choosing a school. I’ve also seen some questions from some of my friends in the industry who have never finished their bachelor’s degrees and are having difficulty getting managerial positions because of this. So, you want to get another degree? This blog post has been in the making for about a couple of years now, when I first received a Facebook private message from a former student who wanted to go to graduate school. I just never got around to writing it until I noticed that the question has been coming up more often, not just from students who would visit me at the office but also from colleagues in the game development firm that I worked for last year. Those who can, do. 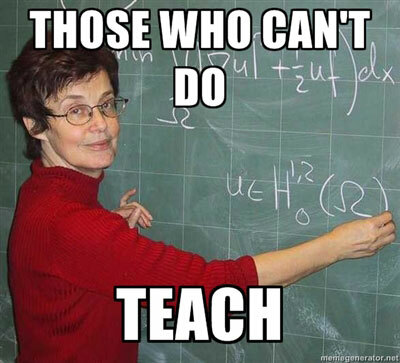 Those who can’t, teach. Huh?